The Downer shopping centre disappeared off the map years ago – too close to Dickson, school closure – and many other factors. The good news is that the building has been completely revamped by a sympathetic developer and a new café is the first in. It is worth the journey – good food, good service and free parking. I spotted several people having meetings, family groups, lone-reading-my book-types, and locals walking across the park to meet and chat. The café is called Gang Gang – one of our popular birds – and an animal known to socialise. Note – the cafe is on the western side so you may not see it at first as you drive in from the eastern side where the shops are still vacant. Recommended – always good to support new start-ups. 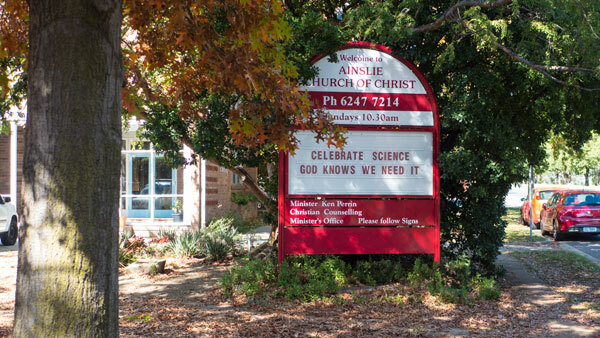 A sign earlier this year outside the ‘church of many messages’ – was about encouraging the celebration of science. Good to celebrate – but what about including them in our urban development discussions. Ideally we should be seeing the appointment of a scientist (or two) to the new urban development authorities. Such bodies, who are making decisions about our city and the planet, need to be empowered to put utmost priority on urgent matters such as biodiversity, solar, water and energy. What chance do you reckon there is that the government will be appointing such people to these new boards? In the next decade we about to be delivered a new Northbourne Ave. Anyone walking on the north eastern edge of the lake can now look across and see what developers deliver when they are given free rein. 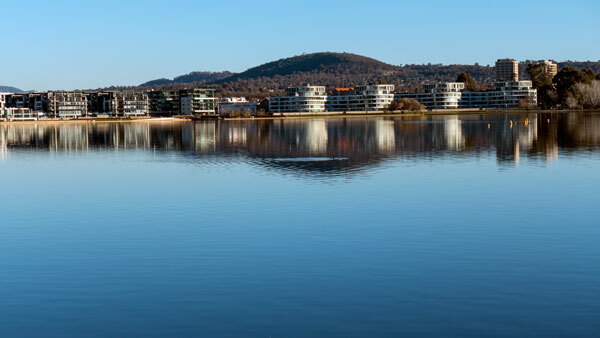 To paraphrase Paul Keating when he described some Circular Quay buildings – these Kingston foreshore buildings are a row of very ordinary toasters. We can do better. So a message to the Chief Minister – here’s an example of what we do not want to see along the new entrance to the national capital. And architects? – we are watching to see some wonderful things – no more toasters please. I love public art. 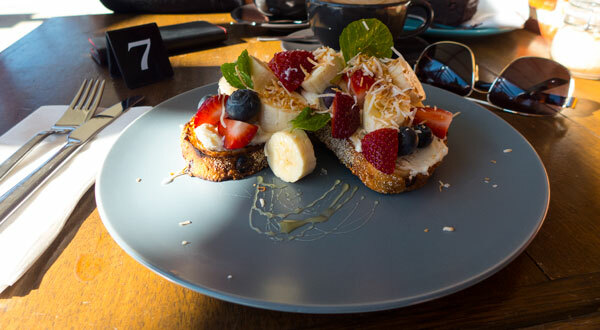 Canberra has loads of good stuff and a few not-so-good. What is wonderful about public sculpture is that there are so many views about all that stuff out in our public spaces. Here a story about one. One I have always liked since its arrival is a piece by Alex Seton in Civic. From the ACT Government database: Artist Alex Seton; Title – Sculpture No 23 (The Parcel); Medium – Western Australian jade green marble, white marble and resin inlay (2003); Location – Civic; Commissioned – 2007. 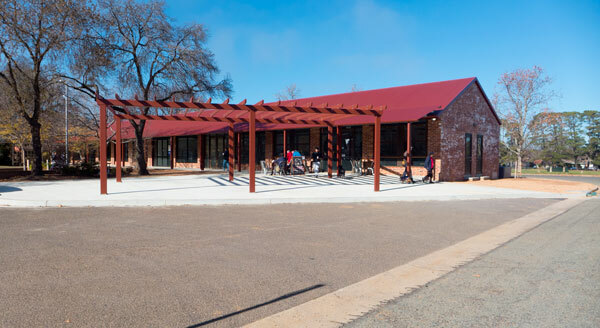 My concern was whether it would be still there following the new development on the corner of West Row and Alinga Streets (the former Canberra Club Building). A couple of months ago I set out to have a look – and there it was – yah! 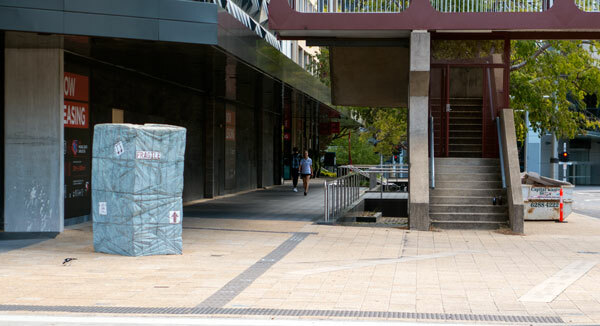 FYI if you spot another piece and you want to know about it, the ACT Government does have a database on the artworks scattered across Canberra – check it out. A little story of an encounter with the art bureaucracy: A couple of months ago I set out to research where the government was with public art – contacted the officer concerned – a reminder or two – eventually she emailed back – she was very busy (fair enough) – she put me onto their ‘communications’ office – he rang – we talked about a time in the near future (I was about to go away for a week or two) and so as agreed I emailed – and then a couple of times when I returned. Absolute silence. Guess that is one form of communications! This might be a little irreverent – but that’s what we do. Sometimes those first words just stay with you. 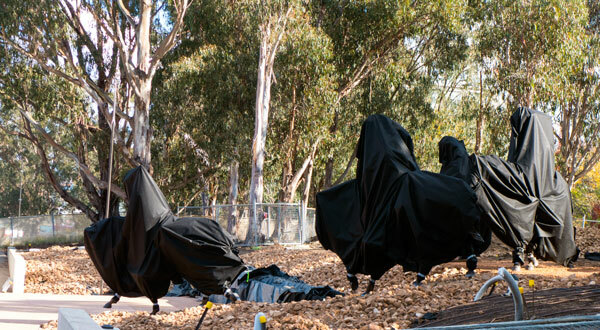 When the new sculptural pieces were being delivered for the new Boer War Memorial on Anzac Parade, the four pieces of artwork were quickly covered over in order to protect them given that work was still going on around them with the landscape features. I was driving past with others when we first saw them – in their covered up state. Someone in the car looked across the ave and said: Oh My God! It’s The Four Horsemen of the Apocalypse! Thanks to that first comment – now everytime I see those four horsemen, it is not the Boer War I think of – but the Four Horsemen who have arrived to set a divine apocalypse upon our world. Is this a sign that the beginning of the end – maybe it is because of climate change is upon us?